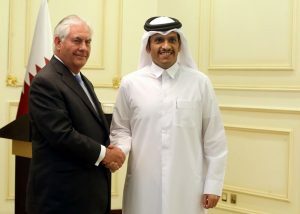 US Secretary of State Rex Tillerson Sunday in Doha sounded unoptimistic for an end to the diplomatic spat opposing Qatar and its neighbors led by Saudi Arabia when he said that Riyadh is not ready yet to engage in talks with Doha. “In my meetings with [Saudi] Crown Prince Mohammed bin Salman, I asked him to please engage in dialogue, [but] there is not a strong indication that parties are ready to talk yet,” Tillerson said after meeting with his Qatari host Sheikh Mohammed bin Abdulrahman Al Thani. Qatar has been embroiled in a diplomatic row since June 5 with Saudi Arabia, United Arab Emirates (UAE), Bahrain and Egypt, the four accusing it of sponsoring terrorism. Doha vehemently rejected the accusations saying they were fabricated and sought to rip off the tiny gas rich country of its sovereignty. Washington has been trying to mend the crisis after US President Donald Trump took the Saudi side. The GCC is made up of Saudi Arabia, the UAE, Bahrain, Kuwait, Oman and Qatar. Kuwait and oman have so far adopted a neutral stand in the crisis. Written by: KanelkaTagba on October 23, 2017. Posted by KanelkaTagba on Oct 23 2017. Filed under Gulf News, Headlines. You can follow any responses to this entry through the RSS 2.0. Both comments and pings are currently closed.